BryceCon offers the unique opportunity to combine a weekend of gaming and convention events with the thrill of visiting Utah's world-famous Bryce Canyon National Park, as well as enjoying the winter activities at Ruby's Inn. Ruby's Inn is offering special convention rates during BryceCon. Be sure to book your hotel room under the 'BryceCon' block for your visit! During the convention we will have both open gaming and scheduled gaming. There will be a designated open gaming area that will be available through the duration of the convention. Scheduled gaming will be organized in blocks. Tables will be assigned for these games. For those interested in running a game, please submit your game on our Game Submissions page. Find out how you can get FREE ADMISSION for running games by visiting our Volunteer page. If you would like to sign up to participate in a game that is being run, please look at the list of games posted for each day of the convention. These can also be found on the Scheduled Games page. We welcome a variety of game styles and themes (ie: board games, card games, role playing, miniature, group games, etc.). 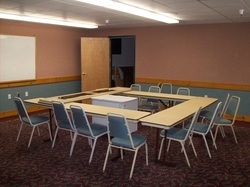 Ruby's Inn has six conference rooms where the scheduled gaming, open gaming, vending, and flea market will take place. Red Canyon Room A and Red Canyon Room B are identical and are separated by an accordion door. Red Canyon Room A is shown here. The four convention rooms on the second floor are each the same size and are also separated by accordion doors. The Sage Room is shown here. The address to Ruby's Inn is 26 South Main Street, Bryce Canyon City, Utah 84764. The hotel is about one mile from the entrance to Bryce Canyon. Be careful when using a GPS unit for travel. Always stay on paved roads through Utah's Color Country. Paved roads are generally well-kept and safe for driving.